These are called 'quick' because they can be eaten the day after they are made. This recipe is adapted from Judy Rodgers' Zuni Cafe Cookbook (Norton; £19.05). Put everything except the onions in a wide, non-corrodible saucepan. Bring to the boil, reduce the heat, cover and simmer for 3 minutes. Turn off the heat and leave to infuse until cold. To speed cooling, put the pan in a sink full of very cold water. Peel the onions and slice medium-thick. Separate each slice into rings. Put the pan of spiced vinegar, uncovered, over a high heat. When it is at a full boil, stir in 1/3 of the onion rings. As soon as the liquid returns to the boil, remove from the heat and, using a slotted spoon, remove the onions from the hot liquid. Spread them on a plate to cool quickly. Repeat the process twice with the remaining onions. Cool the onions on plates, and cool the vinegar by putting the pan in a sink filled with very cold water. Once both are completely cold, repeat the entire process twice, again blanching the onions in 3 batches. Take care not to drop the onions into the vinegar until it is at a rolling boil, and make sure you completely cool the onions at the end of each blanching. This all helps to retain the colour, flavour and crunchy texture of the onions. Now chill the vinegar. 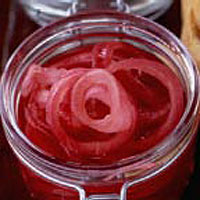 Once completely cold, add the onion rings and transfer to 2 x 300ml-capacity sterilised jars. Store in the fridge for up to 4 weeks.